When Godzilla emerged from the sea and terrorized the streets of Japan, people fled in a frenzy of terror. Here at SP we would like to think that the unveiling of our SPE Godzilla Package will do the same to anything on the road it crosses paths with. 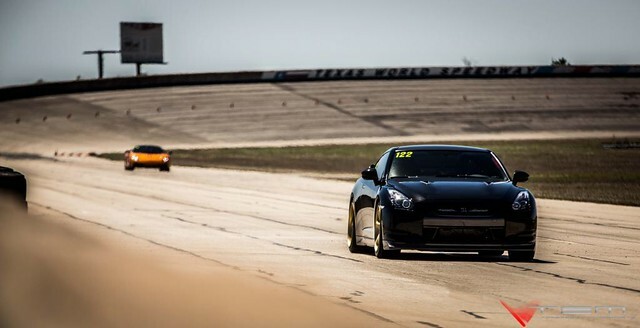 Throughout the past few years of R&amp;D, as well as installing our packages on multiple cars, we have learned a great deal about the GTR and we decided it was time to create a package that could reach even greater goals than our 1000R Package. 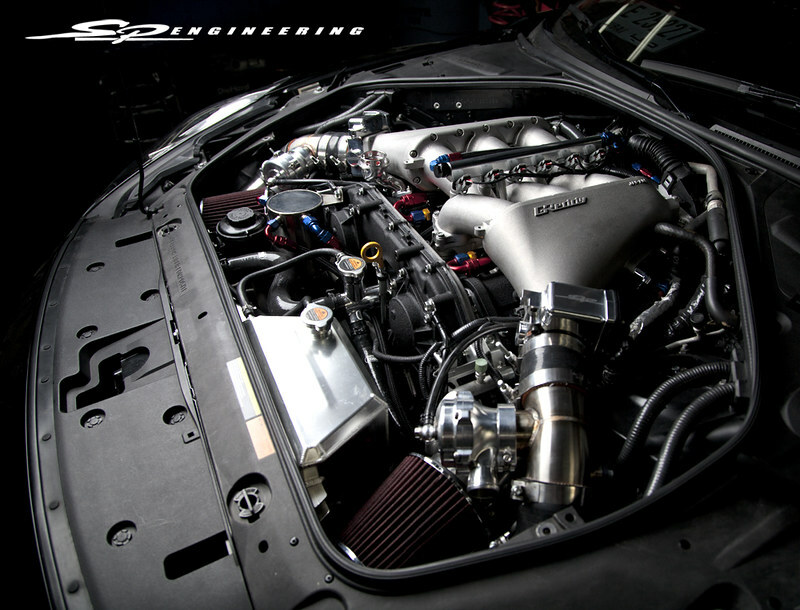 Meet our SPE Godzilla Package, capable of producing a monstrous 1800+ Crank Horsepower on E98 fuel. As well as beefing up the motor's internals, the GR6 transmission is upgraded in house with a stronger gear and clutch system to accommodate the massive power increase. 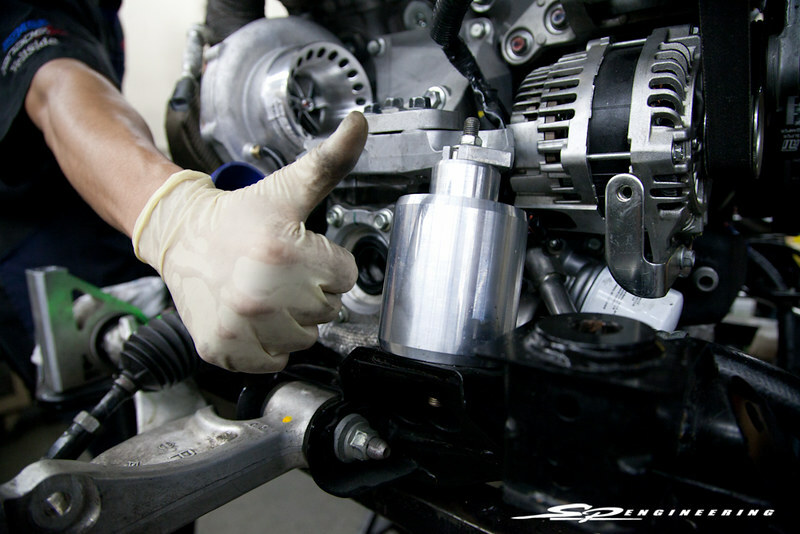 While the internals of the motor/transmission are a key ingredient to handling the power, the external components of the motor are a key ingredient to adding all that power. 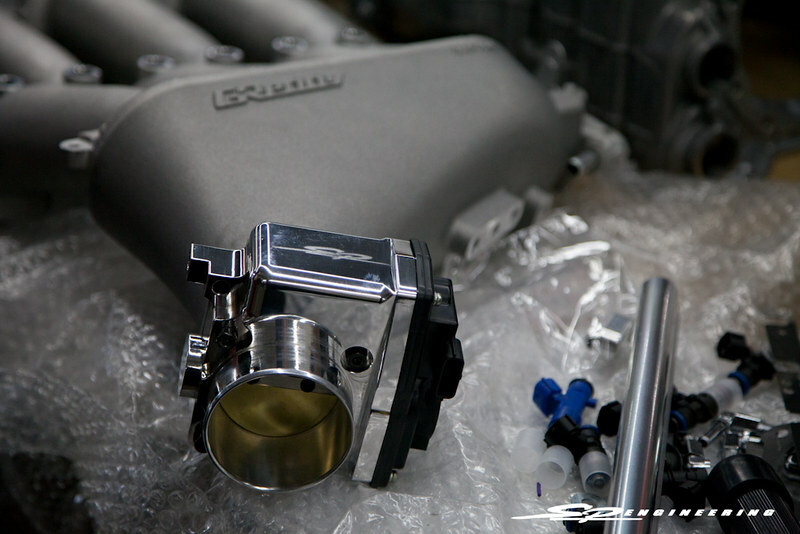 Such as our SPE Spec Throttle Body combined with the SPE Spec Greddy Intake Manifold. The SPE Spec Greddy Intake Manifold holds an additional custom tapped fuel rail to provide the amount of fuel needed for all the power: specifically 3000cc in each cylinder. This is vital as being tuned on Ethanol requires an average of 30% more fuel than regular gasoline. 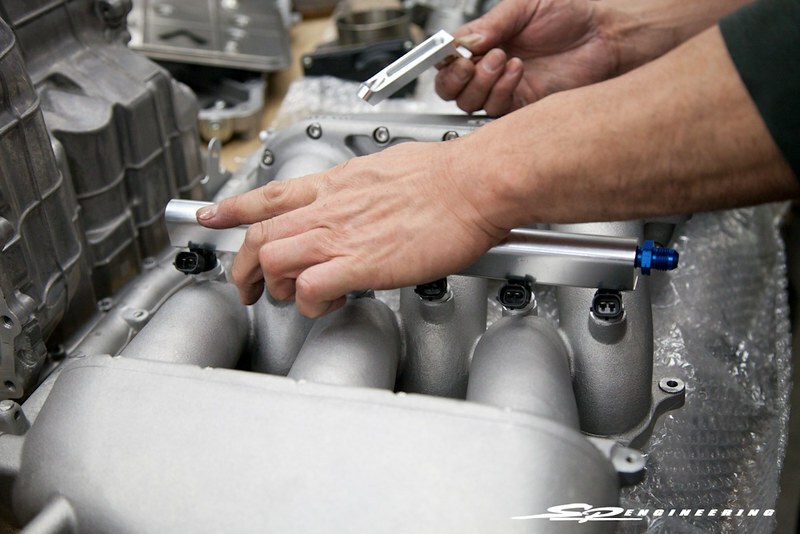 A great deal of custom work goes into the Godzilla package, such as our SPE Spec Custom Manifolds built in shop. Each custom piece is manufactured to the utmost precision to provide consistency in any build. Our SPE Spec Titek Solid Motor Mounts is another prime example of this. 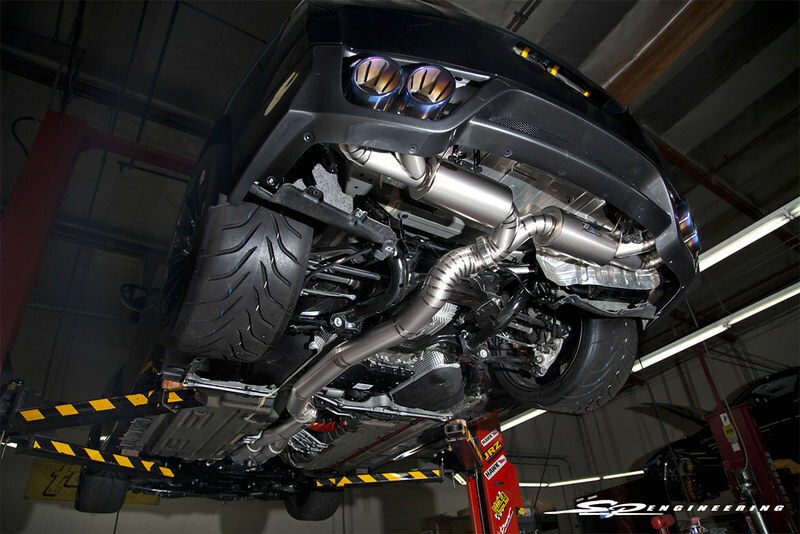 Our absolute pride and joy however, is our SPE Spec Titek 102MM Titanium Full Exhaust, which is included in the Godzilla Package. It weighs in at 27.9 lbs, roughly 30 lbs lighter than the OEM exhaust. 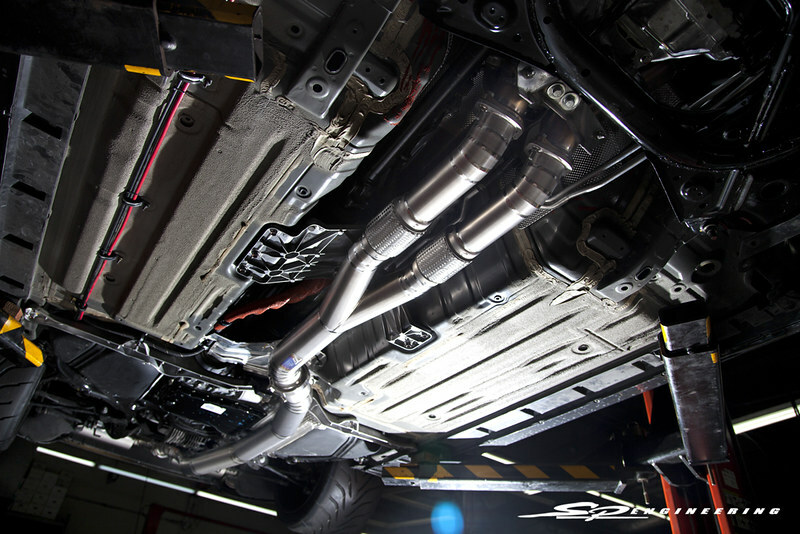 Every aspect of the exhaust is titanium, and it flows as follows: (2)80MM piping -> v-band -> (1)102MM piping -> v-band -> (2)80MM piping -> v-band -> (4) 80MM tips. The 102MM aids greatly in avoiding back pressure and is a critical component to this build creating so much power. 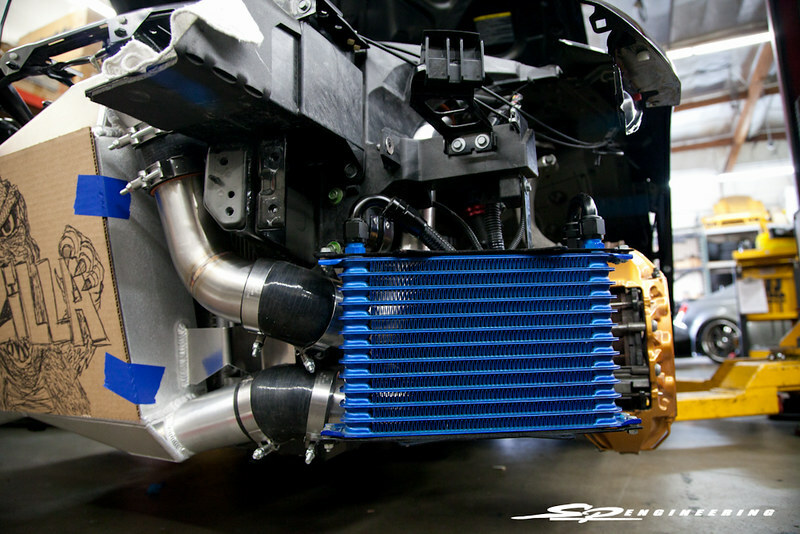 All this added power creates some seriously high temperature numbers for the motor and transmission, so our SPE Spec ETS Race Intercooler System is installed (Godzilla Art not included) to provide even greater cooling. A Greddy DCT Cooler for the transmission is included as well, which allows for optimal hydraulic pressure and maintains extremely consistent temperatures not effected by coolant temperatures. After everything is installed and the cooling is taken care of, the vehicle is brought around to the dyno and the most vital part of any build begins. Our SPE engine calibration is achieved with Syvec's S8 (SGTR) which allows for absolute engine management control. This leads to the photo most important to any build, the claim to fame. 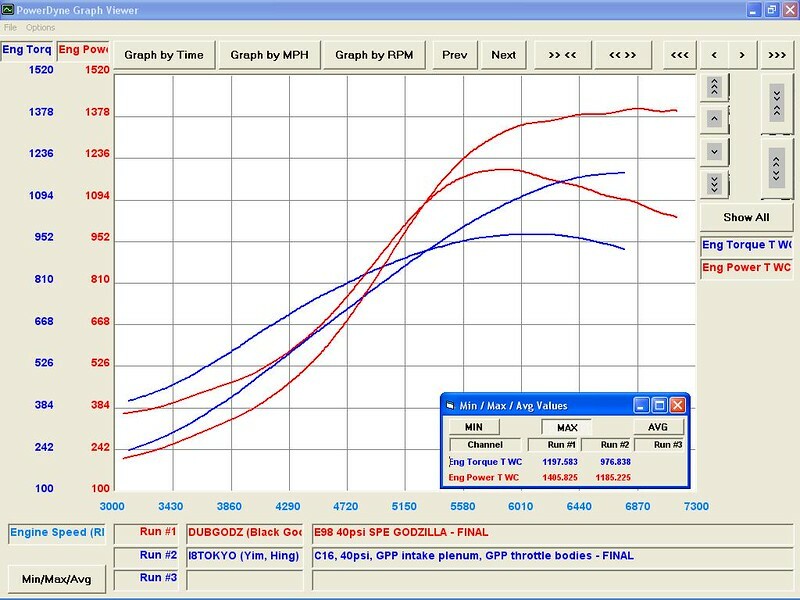 That is of course, the dyno graph. For those wondering, that right there is 1.0 BAR beginning at 4500RPM, 3.0 BAR (Full Boost) beginning at 5800RPM leading to a consistent 3.0 BAR from 5800RPM to 8000RPM. This in turn, produces the numbers of a max torque at 1197 and a max power at 1405 to the wheels, power even Godzilla himself would be intimidated by. Side by side comparisons are crucial to measuring improvements, so the photo above presents our Godzilla Package on the same graph table as one of our customer's SPE1000R Package. The SPE1000R package produced a max torque of 976 and a max power of 1185. 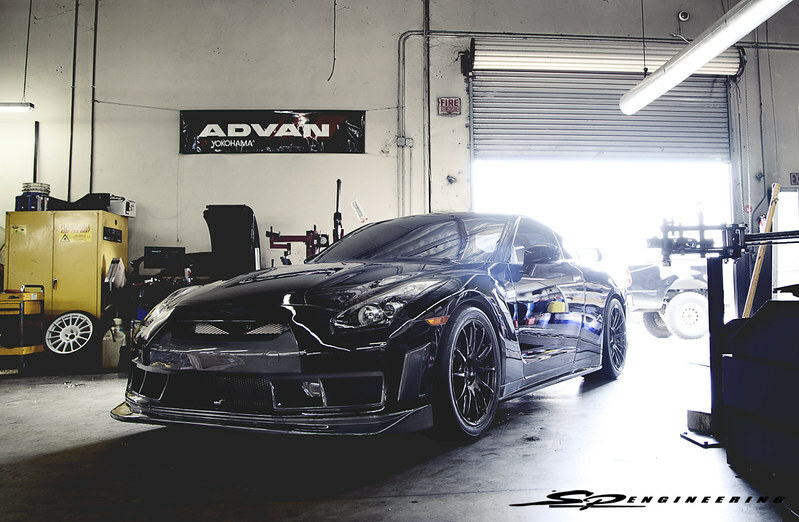 Here at SP we are as anxious as you are to see what 1/4 mile times the Godzilla Package will be able to produce. We are doing some final testing and ensuring the tune is dialed to maximum efficiency. So stay tuned for those numbers (as well as increased power/torque numbers). They will be here soon.. If you have any questions regarding the Godzilla Package, please contact Alex (turboalex@sp-power.com) or Eugene (eugene@sp-power.com). Oh ... My ... G O D ... ! Incredible build guys! this thing will be nuts! when is the track day scheduled- if it vegas,let me know would love to come and watch !! This is going to be crazy. Let's see if you can break 8.7! Crazy looking that thing must be a handful past 5800 rpm. Can't wait to see how it does. I can see 8.5 already! 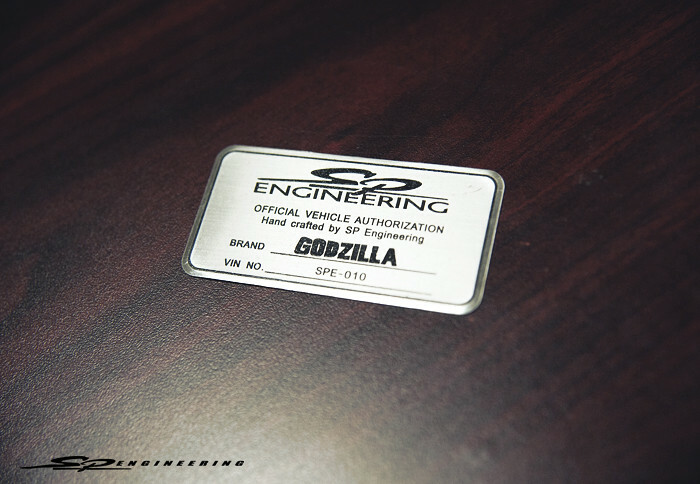 Love the Godzilla art work on the front of our intercooler I need to get a copy so i can include it going forward. haha Great Job Eugene and crew! spe to reclaim the record! but you got competition. I cant speak for SPE but I sure will try when I get this pkg installed. SWOOOOOOOOSH!!!!! vroom vroom! 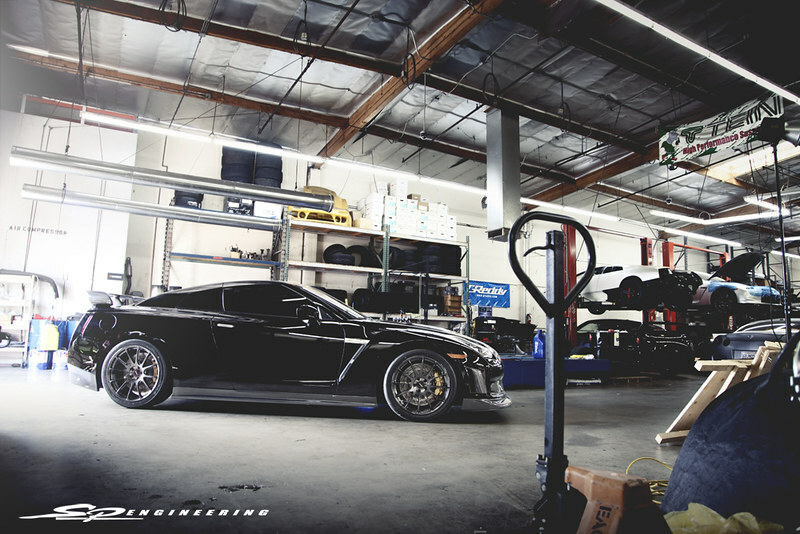 that's right you pilot your gtr!